I love the foodie blogroll. It's a great community of food bloggers started by The Leftover Queen. Every month she hosts the Royal Foodie Joust where bloggers come together to create dishes based around three ingredients. This month, the ingredients were fennel, dairy and parsley. 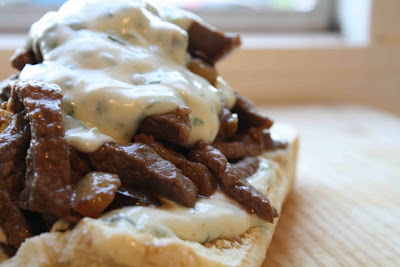 I decided to take another go at the boyfriend's favorite sandwich and do a twist on the philly cheese steak. I've sauteed fennel instead of the traditional onion and made a parsley cheese sauce to top everything off. He seemed to think it was a keeper. I think he would still prefer the traditional version, but this is one for the rest of us. Melt butter in a medium pan and sprinkle flour over. Stir until a roux is formed and cook for 1 - 2 minutes, stirring constantly. Heat milk in the microwave and began adding to the roux in half-cup increments. Make sure each addition is fully incorporated and allow mixture to cook down slightly before adding the next. Once the entire pint of milk is incorporated, remove from heat and stir in 1/2 t of fennel salt, parsley and cheese. Quarter fennel bulb, core and slice thinly. Melt remaining 2 T of butter in a pan and add fennel. Sauté for 5 minutes and add sliced mushrooms. Cook until fennel is soft and starting to caramelize. While fennel is cooking heat 1 T olive oil in a pan on high and cook sirloin quickly, cooking in 2 rounds if necessary to avoid crowding the pan. Season with remaining 1/2 t of fennel salt. Toast french rolls and spread cheese sauce over each roll (thinning cheese sauce with more warm milk before serving if necessary). Layer fennel mixture, followed by steak and finally more cheese sauce. Enjoy! What a great way to incorporate the ingredients! Thanks for the cookie comments but this looks like heaven. I'm so excited to try it! Looks like a nice twist on a classic. Well done! I like Philly Cheese, never used it for cooking though, this looks delish! Good luck in the Joust! This is a fantastic twist on a great original. I would love to give this a try. Gorgeous and tempting photo! I dig philly cheese steak. I'm not used to cooking with fennel and this would be a fun recipe to test it out with. Thanks for sharing.